Tennis specialist Craig Vickers (@craigvickers_) previews day fourteen of the Australian Open and provides us with his best bets. 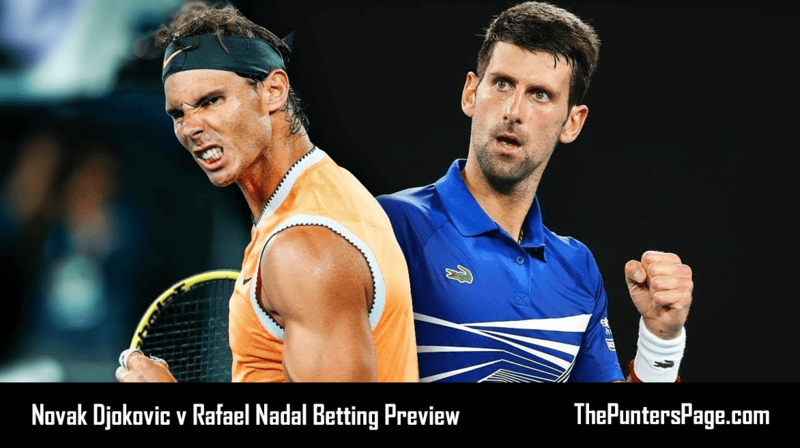 Sunday marks men’s final day at the 2019 Australian Open as world number one Novak Djokovic battles number two seed Rafael Nadal in a 53rd career meeting. We returned to winning ways on women’s final day as Naomi Osaka and Petra Kvitova traded blows for over 2.5 sets (6/4) and deep into a deciding set which scored us our over 22.5 game wager (21/20). After taking the opening set on a tie-break the Japanese fashioned three match points to seal her crown in straight sets, but she wobbled and allowed the Czech to force a decider. Moving on, however, and Djokovic – seeking his seventh Australian Open title – opens as the bookie’s favourite with Bet365 offering odds of 20/27 on the Serb to make history Down Under. Those odds are undoubtedly highly influenced by Djokovic’s semi-final performance against Lucas Pouille when the Serb dropped just four games in an hour and 25 minute workout. Prior to that, it was fair to conclude that Djokovic was yet to produce his best level in Melbourne this year, toiling midway through his fourth round clash with Daniil Medvedev. He was likewise forced to four sets by Denis Shapovalov after a dip in concentration in set three. His virtual bye quarter-final with Kei Nishikori, then, seems to have reinvigorated the Serb and he is hitting the correct notes at the right time with Nadal in equally menacing form. The Spaniard is yet to drop a set this fortnight and he has not dropped serve since his first round match with James Duckworth, carving open the Next Gen pack Alex De Minaur, Frances Tiafoe and Stefanos Tsitsipas with consummate ease. Djokovic is a different animal, though, and the demons of their Wimbledon semi-final epic last year will still be lingering in the Spaniard’s mind considering how close he was to adding another grass court major to his collection – with Kevin Anderson a sitting duck in the final. The world number one won only four more points that afternoon and what is particularly noteworthy in their rivalry is that the last 10 victories have went the way of the player who has won the opening set. The previous two opening sets between the pair have went to a tie-break and with that in mind there is value in over 10.5 games 1st set total at 8/5. You would have to go all the way back to Indian Wells in 2016 to find their last meeting on outdoor hard – and again the first set went to a tie-break – with Djokovic winning their last five clashes on the surface stretching back to the final of the China Open six years ago. Nadal’s biggest hurdle in Melbourne in recent years has been his inability to stay fit and, aside from taping on his abdominal, the Spaniard looks in fine shape if he is stretched to the physical limit having not played since the US Open last year prior to this event. Picking a winner would be foolish considering the ability of both men and instead we will look to the in-match markets.